Performed in conjunction with Dubac's other show The Male Intellect: An Oxymoron? Robert Dubac in The Book of Moron. Photo by Jane Marcus. BOTTOM LINE: Robert Dubac has lost his memory, but he can regain his sense of truth with the help of his wit and the voices in his head. 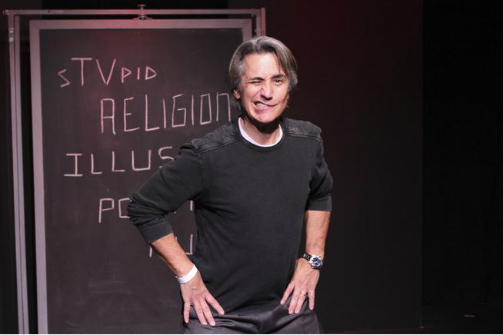 Robert Dubac, or Bob, presents himself on stage only to discover not only is he suffering from retrograde amnesia, but he is actually in a coma on a hospital bed. So, for the next seventy five minutes we are stuck inside Bob’s head while his voices help him answer profound questions; what does he believe in? What are his scruples? What is “the truth”? How do you even know when you have found the truth? And why is there a dog biscuit in his pocket? Well, the silver lining is that his amnesia has left him with a blank slate so that he can rebuild his sense of truth entirely while re-teaching himself how to think critically. Thus is the crux of his play The Book of Moron which is being presented in conjunction with his other play The Male Intellect: An Oxymoron? In watching this mash-up of stand-up comedy and theatre, Robert Dubac without doubt has a nuanced grasp on comedic structure. Whether he is following the script or ad-libbing, his jokes are impeccably polished. And his mastery of language only serves to enhance his comedy. Anyone can tell a good joke, but it takes practice to land a joke that is all together simple, funny, and imbued with multiple meanings. Keeping the show’s premise very simple was also a smart choice so that Dubac can keep his jokes focused on the play’s purpose – thinking about society’s eternal conflict between the truth and idiocy. Even with its simple plot and well placed humor, I still left the theatre with questions about the show’s overall structure. The role of Dubac’s retrograde amnesia was particularly problematic. For the first half of the show the fact that he can barely remember anything about himself is pivotal in moving the story along. Then, all of the sudden his memory loss becomes an afterthought, and he tells jokes complete with recent pop culture and political references as if he never had amnesia at all. Sure, his multiple voices may have access to memories that Dubac has yet to tap back into, but that fails to explain the sudden lack of concern regarding his amnesia or his coma. It is also in this second half when his performance begins to feel less like a play and more like a stand-up routine.